Discussion in 'The Republic' started by Ecclessey, Sep 20, 2018. Yesterday on Discord I mentioned the interest of -together with you guys- write as the crew of a Republic vessel. In the past hour or so I've been toying with two ideas for potential ships and character roles that could fit into your level and rank within the Republic main faction. Note that as your character progresses in level and rank your role on board or indeed the type of ship we crew might change. In the two posts below I've posted two potential vessels for us to RP in. If you're interested in writing this story with me, please post in this thread and tell me the ship (and added first story plot) that has your favor. The Bantha of the space lanes. 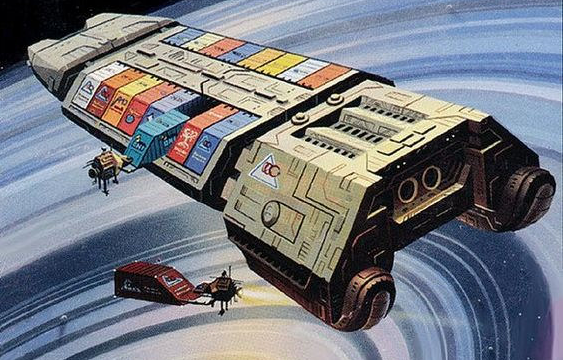 The A3 Heavy Freighter is a mid-line bulk cargo hauler, capable of moving hundreds of tons of cargo- massive amounts of trade material, arms and munitions, industrial supplies, etc- to and fro across the length of the Galaxy. It is manufactured by Corellian Engineering Corporation in orbital dry docks- the A3 is a dedicated deep space cargo hauler, and is not designed or rated for atmospheric flight, and most of the ships will never touch the ground (at least not on purpose). The hull is basically a giant engine block at one end and a cargo bay at the other, connected by a long central spine containing the bridge and operating systems, crew and passenger quarters, galley, refreshers, and everything else the ship needs to function. Branching off the central spine between the engines and cargo bay is a criss-cross of dead-end corridors capped with airlocks and clamp-control stations, while the exterior of the spines are covered in various cargo clamps. The clamps are designed to be compatible with a wide number of standardized cargo modules and containers, allowing the freighter to move huge amounts of cargo with a minimal waste of space associated with the interior cargo storage most freighters rely on. Despite its massive size, the A3 is designed to be operated with a very minimal crew to keep personnel costs low for interstellar shipping companies- just enough to keep the ship on course and to maintain integrity of the cargo on long hyperspace flights. At a minimum, it requires a pilot and co pilot, as well as a sensors and comms operator- the sensors operator is required since the ships bridge is centrally located and does not feature any veiwports for manual navigation. The ship has a standard shielding array (operated at the sensor station), but is entirely unarmed so as not to be considered a capital craft, which would make it heavily regulated by galactic law. It does, however, feature a pair of independently operated tractor beam generators on extendable control arms on opposite sides of the ship, which are typically used for maneuvering cargo containers. In its standard configuration, the A3 features 2 spacious passenger cabins with four fold out bunks each, designed to house additional cargo handlers. The ship is incredibly slow and clumsy to maneuver, both in real and hyper space, so standard procedure is for it to jump as close to its destination as it can and sit still while being unloaded by relays of smaller freighters or cargo tugs. The ship was clearly designed with a single purpose in mind- bulk hauler- and that is by far its most common usage in the galaxy. Lines of A3's waiting to be unloaded are a feature of nearly every busy trade world in the Galaxy. It is far too slow and lacking in space and comfort to be used as a passenger craft, and while it's size and sturdy hull plating lets it take a beating, the cheap civilian grade shields and complete lack of weapons makes it worthless as a military vessel. Still, the galaxy is notorious for finding ways to abuse things. Some pirate groups have appropriated the vessel and use it as a poor-mans carrier and mobile base of operations. 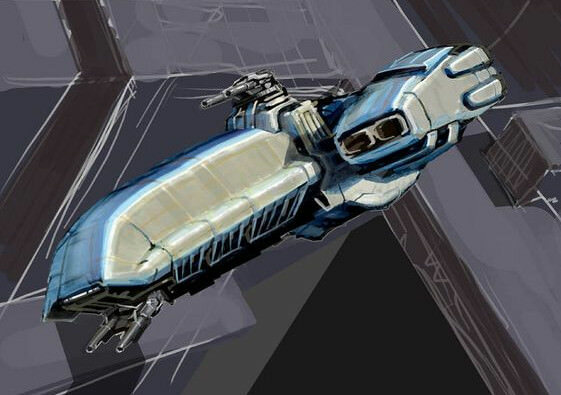 They take advantage of the internal cargo bay to house fighters or armed shuttles to mount raids, or use the tractor beams to ensnare unsuspecting smaller ships for boarding, and sometimes even convert the passenger cabins into makeshift brigs for taking hostages for ransom. It's not especially efficient, but the ship is cheap and readily available, making it perfect for such desperate scum. The massive amount of available space and the numerous hidden nooks and crannies of the ship make it difficult to effectively inspect for planetary customs, and many unscrupulous Captains make fat wads of credits smuggling spice and other contraband alongside their legitimate cargo. The Republic Cargo Ship 'Valorum' was named after former Chancellor of the Republic Mori Valorum and has a crew of 5 commission Republic Navy Officers, two droids and seven Republic Navy crewmen. The ship is flown almost exclusively on auto-pilot and the bridge crew operate based on a six hour shift, where either the captain or the first mate take seat in the pilot chair and function as sensor operator. The Chief Engineer and Chief Communication officers are on twenty-four hour standby, which means they have no fixed times on post but can be called upon at any hour. The Loadmaster cargo and ballast management and during flight functions as the chief logistics officer. The seven crewmen are assigned where needed. This is primarily the engine room and cargo decks during flight and otherwise they assist in the operation of the tug and shunts in complement. Because parts for warships are expensive, your mission will be to salvage wrecked Republic vessels near Hutt Space of anything still valuable. Do not bother to salvage late personnel from these vessels. Your priority is weapon systems and shield technology. Please go to the Corellian Drydock forty-two-dash-eleven and report to Commander Russ P. Fran, the captain of the RCS Valorum. The Drexl, per its namesake, is the fierce predator stalking its home system searching for prey and the darkest fear of every pirate in the sector. The light corvette was designed for a very singular purpose- destroy enemy ships. To this end, the unusually small ship for its class is little more than a set of oversized guns strapped to a set of equally oversized engines. The pair of dual turbolaser turrets and set of torpedo tubes makes the Drexl far more heavily armed than most ships in the Corvette class, and its large engine pods on the small frame give it considerable speed and make it surprisingly nimble as well. The armament and maneuverability means that even one or two of these craft are a serious threat to larger capital ships, and a squadron of them could even maul a cruiser in a straight fight. The ship isn't without its downsides though. The unguided torpedoes and slow tracking fire control systems on the turbolasers make the Void Shark vulnerable to being picked apart by fighter screens that it can hardly defend against, and the prominent unprotected engines make an enticing target for enemy gunners. The ship is designed to function with a smaller crew than most ships in its class, and makes the most of its cramped interior space. The bridge can be handled with only three personal, though operating all systems (barring weapons, each of which is manned by a separate gunnery team) requires a full 6 man bridge crew. Outside of bridge crew and gunners, the ship hosts a small team of mechanics, a medic, and a cook, plus relief crews for key stations. Though the ship is somewhat cramped when fully staffed, it does have space for a small contingent of troops to conduct or repel boardings, though acting as a boarding craft in its own right is outside the scope of its duties. Drexls used to be employed in pairs or groups of three to harass enemy capital craft, often with a dedicated fighter screen or pair of anti-fighter corvettes to defend them. A strike force like this could make Captains of even the largest craft think twice about engaging without backup. Since the draw down of major fleet engagements, however, the Drexl has seen its place in major navies declining. It is now relegated to hanging around near major planets or military installation, in case better equipped multi-role craft need back up against a rogue freighter or wayward pirate vessel. The most exciting mission a Drexl Captain could be assigned in this day and age is as part of a pirate hunting task force, and these tasks are viciously fought over among officers in many navies who have become bored with peace time soldiering. The Republic War Ship 'Deryck' was named after current Chancellor of the Republic Vincent Deryck and has a crew of 5 commissioned Republic Navy Officers, multiple supporting droids and 25 Republic Navy Crewmen. Due to the high-risk nature of this vessel it is almost exclusively piloted by hand, which is assigned to crewmen in rotating shifts. During combat situations either the Captain or the First Officer 'has the bridge' resulting in a six hour rotating shift. During transit the navigational officer can also have the bridge, which means a rotating shift of 4 hours will be in place. The twenty-five crewmen are assigned where needed. They are divided between bridge crew, gunnery groups, mechanics and logistics plus medical support. For the upcoming mission in particular there's a small contingent of Republic Marines on board to conduct and repel boarding actions. Your mission will be to disrupt Hutt Cartel shipping and lay waste to planetary defenses and shipyards. Make the cartel pay and protect the Republic from the influence of the vile Hutts. Please go to the Corellian Drydock forty-two-dash-thirteen and report to Captain Finn Sul Onn, the captain of the RWS Deryck. I'm down - pilot/first mate. I have a character slot open and this sounds rather interesting. I would love to join something like this in the next timeline.